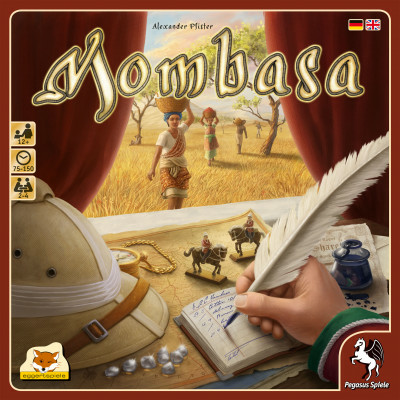 In Mombasa, players assume the role of investors in four trading companies in 19th century Africa. Players start the game with relatively weak plantations, and over the course of the game they need to manage and improve these plantations in addition to digging in mines for gold. Each round players choose three action cards from their hand, then reveal them simultaneously and carry out the actions. These cards are then placed in a discard pile and the previously played cards recovered for the subsequent round. As players earn funds, they can purchase new action cards or invest in the trading companies, which increases the value of those shares. Each company has a double-sided investment strip, so companies will vary from game to game based on which sides of the strips are revealed.